Transform PowerPoint into a powerful interactive e-Learning Courses Designer. Zenler Studio is a powerful, yet easy-to-use, e-learning authoring system that offers a programming-free environment for creating high-quality interactive e-learning courses which can be published on the Internet or to any SCORM/AICC compliant LMS. See how the Zenler platform can transform your eLearning needs. 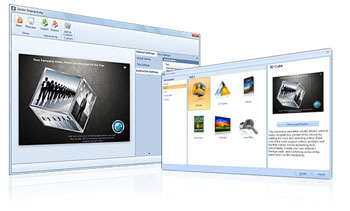 Leverage PowerPoint - the most popular and powerful editing environment available. No more expensive Flash eLearning content creation. 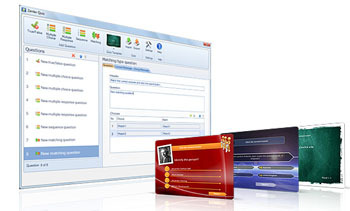 Zenler Studio brings unprecedented power to trainers to create engaging eLearning experiences. Zenler Studio comes with a Course Designer that sits right within PowerPoint and lets anyone create courses with great ease. Select readily available stunning course styles to base your courses on or design your own. Engage your trainees like never before. Our Course Designer (Patent pending) menus can be accessed from the PowerPoint Ribbon and also from the Zenler Course Designer pane right within PowerPoint. Creating a course is very easy. Click the Course Icon and using the course wizard select from the stunning range of pre defined course structure styles available or create your own. Course Wizard lets you select the number of chapters to be added, select quizzes at end of courses and select the readily available course styles and there you have it â€“ a readily available course style for you to base your content on. If you want to design your own course structure, you can select that blank course option from the wizard. Add chapters, quizzes, interactions, screen recording using the Zenler course designer pane with a few clicks. Zenler Quiz takes a revolutionary approach to creating Flash Quizzes. Apply Quizzes directly into PowerPoint and publish the Quiz to Flash. Select from a range of amazing Quiz styles. Quizzes can then be published to web ready Flash. With just a few clicks you can add your questions, select questions to your question bank, add them to your course. Track the results online on any SCORM compliant LMS. You can also limit the number of quiz attempts and restrict navigation. Zenler Interactivity lets you add rich e-learning interactivity into your courses with a few clicks. Each interactivity effect is unique, visually stunning and can be easily added and doesn't require any programming knowledge. It lets you create stunning web ready interactivities like eBook, 3D Cube, Calendar, Panoramic Zoom, 3D Wall effects and more in few clicks. Transform the way you train your trainees. Interactivity keeps trainees interest alive throughout the training. Engage your trainees and give them a learning experience that makes them come back for more!. Easy to use Screen Recording allows you to capture your screen video and create quick demos and insert them directly into your Course. Zenler Studio comes with a built-in screen-recorder tool so that no additional software needs to be installed. Simulations are recorded directly into the Course editor. The Screen recorder allows you to easily capture the whole desktop, a portion of screen or a window. Video narrations can then be placed w.here the trainer wants his narrator video to appear on the screen. Give individual touch to presenting your course by recording narrations. Zenler Studio provides an opportunity to insert Audio and Video narrations in your e-Learning course. Importing existing audios and videos or recording them right from within your PowerPoint. Inbuilt recorders helps user to record audio and video narrations into course. When you have tons of word documents you don't want to create a slide for each page. Word Import feature allows you to insert word document as an ebook inside the course. Import feature helps the user to easily import Word and also PowerPoint presentations into your course.Using PowerPoint import you can directly import whole presentation or specific slides to the elearning course thereby you can rapidly create your course easily from your existing powerpoint slides. You can add information about the trainer/presenter and branding onto the course player. Trainees can then access information about author easily from the course player. Zenler Studio makes it possible to add interactive scenarios in elearning courses. Zenler Studio comes with scenario building facility. With this feature user can create elearning courses with complex scenario in just a few minutes. You can edit existing scenarios, add scenes, add avatars and changing dialogues is just as easy, and you can do it in minutes. No programming skills needed to create these scenarios using Zenler Studio. Easily deliver your elearning course anytime anywhere. 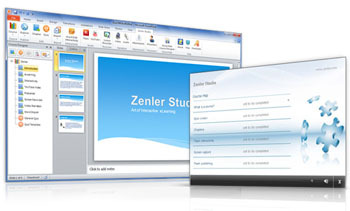 Zenler Studio allows you to distribute elearning course the way you want. Easily create SCORM or AICC compliant content for Learning Management Systems and track the course effectively. Transform your course into a Flash-based course that can be hosted on virtually any Web server and viewed by almost anyone. User can also publish to Zenler Online to track e-learning course activity without the usual cost and hassle. Zenler Studio generates courses that can be easily uploaded to any SCORM/AICC compliant Learning Management Systems. Courses created with Zenler are compatible with virtually all Learning Management Systems, including Moodle, CourseMill, BlackBoard, Zenler Online LMS and many others. Zenler wins the Best of eLearning awards 2012 in four categories and an Award of excellence. Zenler won in four categories: Best Learning Management System (SaaS, Open-Source, or Content Supplier), Best Rapid Development Tool, Best Simulation Tool and the Best Assessment Tool. Create Professional interactive e-Learning courses within PowerPoint and share on the web and mobile devices.
" Zenler Studio is highly superior to its competitors in many respects. Its ability to create interactive courses right within PowerPoint takes us to an entirely new level of eLearning development. I would say, this is the only product i see around with a Zero learning curve. " "I have found Zenler Studio a user friendly product. 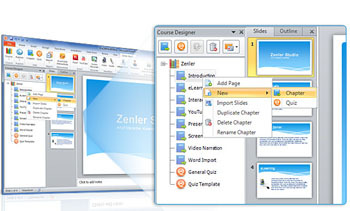 Zenler easily blends into PowerPoint Presentations to create intuitive and professional educational programs. The application does not require programming knowledge, if one can use PowerPoint then Zenler Studio is a breeze. With Zenler Studio Pro creating puzzles and games are made simple. I recommend you try Zenler Studio for yourself! " "Unbelievable!! Its that easy and fast. Zenler provides elearning authors an incredible tool in their own hands to easily create, publish, and update online training and learning interactions. Also Quizzes, ready to use interactivity models, templates etc ..that too within an environment that you already know."